But the question for plant-eaters remains…why? It’s a legitimate question with a complicated answer that can be a bit like discussing politics. Personally, I remain open to welcoming these kinds of replacements because I think they are valuable in transition. Some people struggle with the concept of giving up food they have enjoyed their entire lifetime – things like bacon. So, if there is a viable option that is plant-based (and preferably healthy), then why not bring some comfort to the transition? 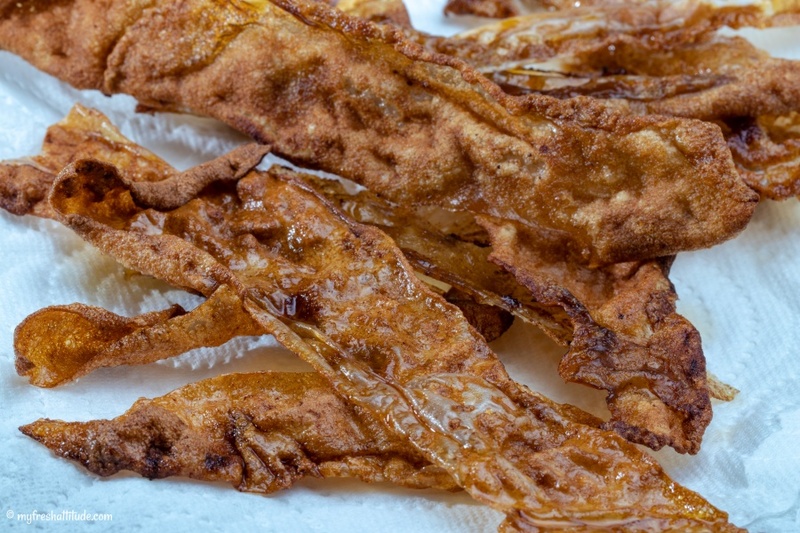 Our version of crispy bacon uses the rice paper method, which seems totally whacky at first, but ends in one of those…huh moments. It’s crispy, salty, smoky and visually appealing. Is it the holy grail of bacon? Probably not, but it does some close and works perfectly well for breakfast, in a sandwich…or as I found out…just to munch on as a snack!